The Best Pie Blogs from thousands of Pie blogs in our index using search and social metrics. We’ve carefully selected these websites because they are actively working to educate, inspire, and empower their readers with frequent updates and high-quality information. Wilmington, NC About Blog The Pie Academy is an online community dedicated to the idea that anyone can learn to make great pies from scratch. Begun in early 2012 by Ken Haedrich, it is his way of sharing his passion for pie with a wide audience. Facebook fans 974. Twitter followers 19. About Blog Welcome to Art of the Pie Blog by Kate McDermott. I love making pie and more than that, I love teaching pie making. I want to show you that making pie is easier than you think. If you are a well-seasoned pie maker or missed learning this time-honored craft when you were young, you will find some pie making tips and hints in my Blog. Facebook fans 2,533. Twitter followers 3,267. About Blog Tiny Pies originated in Austin, Texas in 2011 with the idea to create the freshest, most wholesome, not to mention adorable treat for the pie-lover in everyone. Coming from generations of pie bakers, our founders, Amanda and mother Kit, baked the company out of passion and tradition. We believe that the best pies are not only made by hand but are handheld. We feature a variety of flavors plus a unique Pie of the Month. Facebook fans 340. Twitter followers 1,072. San Francisco, CA About Blog Welcome to Reddit page on Pies. Follow to keep up on discussion regarding the delights of pies including all varieties. Facebook fans 1,188,191. Twitter followers 551,316. Minnesota About Blog Welcome to I am Baker by Amanda. I started this baking blog back in 2009 and haven't looked back since. I love rich, decadent beautiful desserts and creating new ways to enjoy them. Follow to keep up with thousands of beautiful and delicious recipes and videos that are easy-to-make. Facebook fans 2,441,640. Twitter followers 10,503. About Blog Bake from Scratch is a seasonal publication from Hoffman Media. A celebration of baking's many joys, we offer delicious recipes, new innovations, expert tips, and the latest on all things related to flour. Facebook fans 11,863. Twitter followers 1,659. Northern California About Blog Crazy for Crust was started in 2010 by Dorothy Kern. This is a recipe website that shares all sorts of recipes that are sometimes dessert, often crazy, and always served with a slice of my life. Facebook fans 1,024,891. Twitter followers 13,378. New York City About Blog Welcome to Baker by Nature by Ashley Manila. I am a creative spirit with a major sweet tooth. Most days you can find me in my happy place - the kitchen. My blogging mission is to provide you with foolproof recipes and inspiring ideas that will help you celebrate life, and create lasting memories with the people you love. Facebook fans 17,871. Twitter followers 3,300. North Norfolk, UK About Blog Bray's Cottage was founded in 2007 by Sarah, who was ready to leave the corporate world behind and spend her working day in the countryside, where she lives, rather than sitting in someone else's office. She taught the small team, from the surrounding villages, to make the pies by hand. We make the finest pork pies in a beautiful converted flint hay barn, which has beams, a red tiled roof and a sheltered walled garden courtyard. Facebook fans n/a. Twitter followers 16,772. About Blog Welcome to Everything Pies! We are more than just a collection of great pie recipes. You will learn how to discover your own winning pie recipe. Come to know what it takes to bake a tasty pie and how the ingredients work, function and add flavor to the pie. Pierate HQ About Blog Pierate is the World's leading pie resource with 400 pie reviews. No one knows pies as well as us. We set sail in 2009 with a simple mission; to eat and rate every type of pie they could get their gravy soaked hands upon. Facebook fans 237. Twitter followers 2,596. Los Angeles, CA About Blog KCRW creates and curates a unique mix of content revolving around music discovery, NPR news, cultural exploration and informed public. Subscribe us to get all the latest updates on Pie from KCRW. Facebook fans 202,287. Twitter followers 517,132. Seattle, WA About Blog Welcome to Bakerita! I’m Rachel, a baker and recipe developer with a passion for nut butters & creating easy, mouth-watering desserts and baked goods! I share recipes from my kitchen, and I hope they'll make their way into yours. Follow to keep up with hundreds of recipes for all your dessert needs - including a whole variety of dietary needs such as gluten free, Paleo, dairy free, vegan, refined sugar free, and grain free. Facebook fans 23,662. Twitter followers 2,974. Austin, Texas and Chicago, IL About Blog Welcome to Cookie Madness by Anna Ginsberg. This Blog contains a collection of recipes I’ve tried over the past 12 years. As the name “Cookie Madness” suggests, it features more than a few cookie recipes. Facebook fans 978. Twitter followers 2,987. NY, USA About Blog Named The Absolute Best Pie in New York City by New York Magazine, Petee's Pie Co serves a seasonal menu of freshly baked sweet and savory pies made with the best locally sourced ingredients. We blog about shop news, pies we're making, Thanksgiving ordering options, how we source our finest quality ingredients, and more! Facebook fans 3,636. Twitter followers 717. About Blog Welcome to Pies and Plots. I’m Laura Dembowski. This is a blog where you'll find deliciously sweet recipes, the latest on my explorations in writing and my quest to be published, and restaurant and bakery reviews. .
Facebook fans 2,059. Twitter followers n/a. 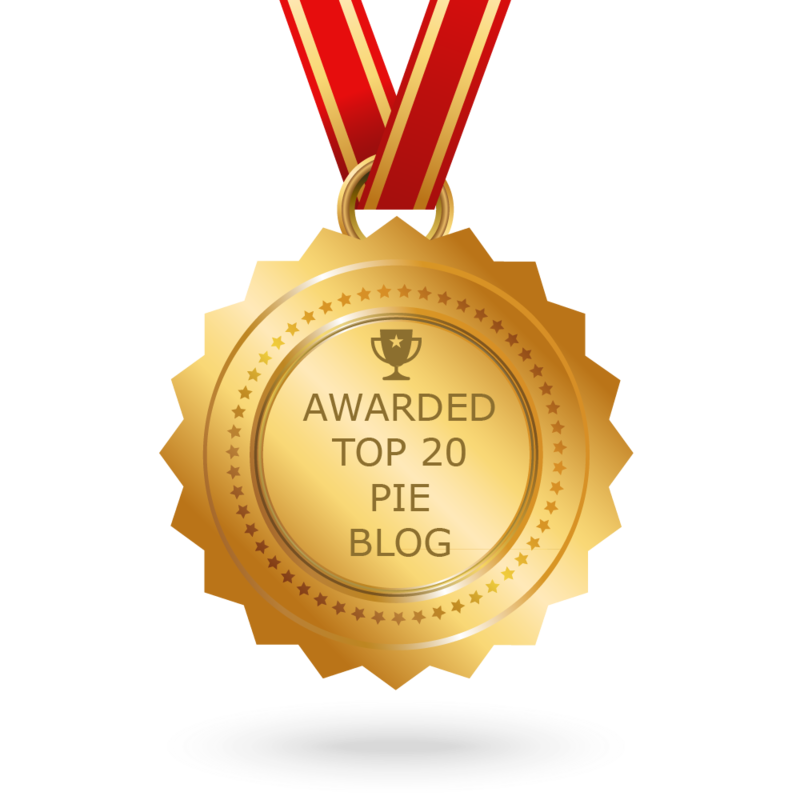 CONGRATULATIONS to every blogger that has made this Top Pie Blogs list! This is the most comprehensive list of best Pie blogs on the internet and I’m honoured to have you as part of this! I personally give you a high-five and want to thank you for your contribution to this world.